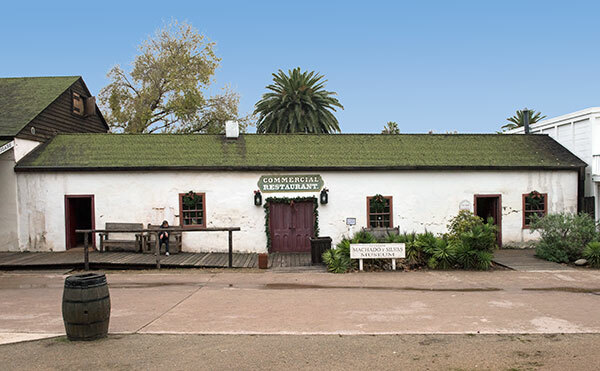 Built in the early 1840s, this rectangular adobe on the plaza was a wedding present from José Manuel Machado to his daughter, María Antonia, and her husband, José Antonio Nicasio Silvas. It had four rooms and three doorways that opened onto the plaza. María Antonia converted the casa into the Commercial restaurant in the early 1850s. The Machado y Silvas family owned the property until the early 1930s. It was a rooming-house, café, art studio, souvenir shop, and community chapel before becoming part of California State Parks in 1968. It is one of the five historic adobes in the park. We were unable to locate a California historical marker for the Casa de Machado y Silvas.